A new study by researchers at the Broad Institute's Stanley Center for Psychiatric Research, Harvard Medical School, and Boston Children's Hospital genetically analyzed nearly 65,000 people and revealed that an individual’s risk of schizophrenia is increased if they inherited distinct variants in a gene related to “synaptic pruning”—the elimination of connections between neurons. 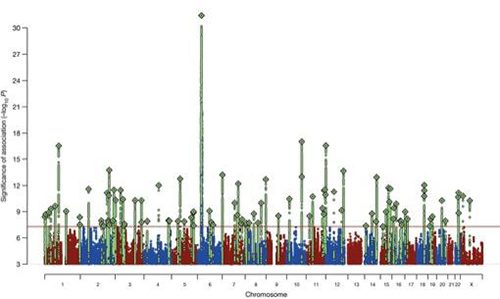 This new data represents the first time that the origin of this psychiatric disease has been causally linked to particular gene variants and a biological process. The gene the research team called into question, dubbed C4 (complement component 4), was associated with the largest risk for the disorder. C4's role represents some of the most compelling evidence, to date, linking specific gene versions to a biological process that could cause at least some cases of the illness. Upon further investigation into the complexities of how such structural variation relates to the gene's level of expression and how that, in turn, might link to schizophrenia, the team discovered structurally distinct versions that affect expression of two main forms of the gene within the brain. The more a version resulted in expression of one of the forms, called C4A, the more it was associated with schizophrenia. The greater number of copies an individual had of the suspect versions, the more C4 switched on and the higher their risk of developing schizophrenia. Furthermore, the C4 protein turned out to be most prevalent within the cellular machinery that supports connections between neurons.